C&T Publishing unveils a new era in quiltmaking with the "Quick & Easy Block Tool," an innovative concept in planning quilt blocks! 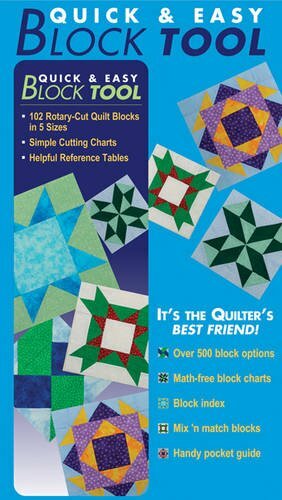 This pocket-sized guide features rotary-cutting directions for over 500 options for making traditional quilt blocks, plus bonus reference tables every quilter needs. The "Quick & Easy Block Tool" is so useful, versatile, and portable, you'll wonder how you ever lived without it! Liz Aneloski learned to quilt in the 1980s when her daughters were very young. She has been an editor at C&T Publishing for a couple of decades, authored eight books, nurtured her marriage for 30 years (and counting), and watched her girls become amazing married women. She says, "What more could a person ask for?" Liz lives in California with her husband and Toby, a 14-pound four-legged ball of energy with a tail that never stops wagging.